Minimum quantity for "Aik Cheong White Coffee 3 in 1" is 1. 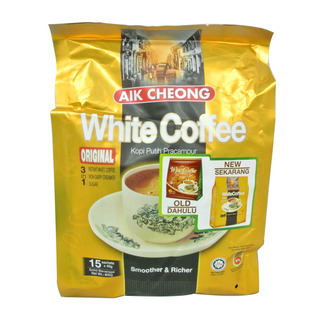 Aik Cheong Malaysia 3 in 1 WHITE COFFEE Original is made only from the finest premium coffee beans. Delicately brewed with fine sugar and non-dairy creamer, it delivers the most exquisite freshness of coffee. Rich in robust aroma and traditional quality, our coffee always renders lasting discerning flavor impressions. Non-Dairy Creamer( Glucose Syrup, vegetable oil, sodium caseinate(contains milk protein), emulsifier e471, stabilizer e340, anti caking agent e554, beta carotene e160a), sugar, and instant coffee. 1. Pour the contents of the sachet into a cup. 2. Add 200ml boiling water.